The Astronomical Phenomena. (Tien Yuan Fa Wei). Compiled by Bao Yunlong in the 13th century. Ming Dynasty edition, 1457-1463. 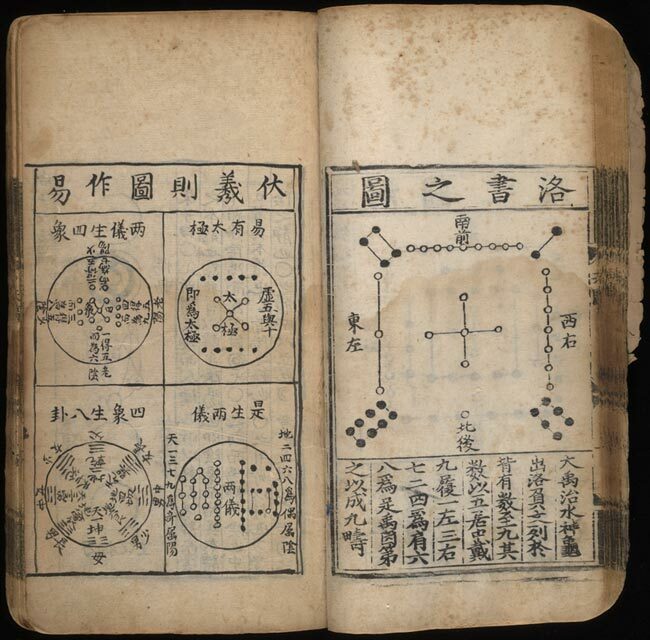 The book is an explanation of the 'Ba Gua' used in the Yi-ching (I Ching or Classic of Changes, also known as the Book of Divination). According to this Chinese world view, the universe is run by a single principle, the Tao, or Great Ultimate. This principle is divided into two opposite principles--yin and yang. All phenomena can be understood using yin-yang and five associated agents, which affect the movements of the stars, the workings of the body, the nature of foods, the qualities of music, the ethical qualities of humans, the progress of time, the operations of government, and even the nature of historical change.